Let me start by saying that I am currently baking my Oatmeal Crunch Apple Pie and my house smells amazing! You really should try that recipe! When you purchase frozen pie crusts they always come in 2 packs. I really don’t like freezing the remaining crust because they don’t wrap well and always end up with freezer burn. So I decided to make this tasty quiche for my dinner tonight. It will be a great main course for dinner at my mom’s tonight. She is making a pot roast which I remember to be a fabulous recipe but I haven’t eaten pot roast in over 7 years! 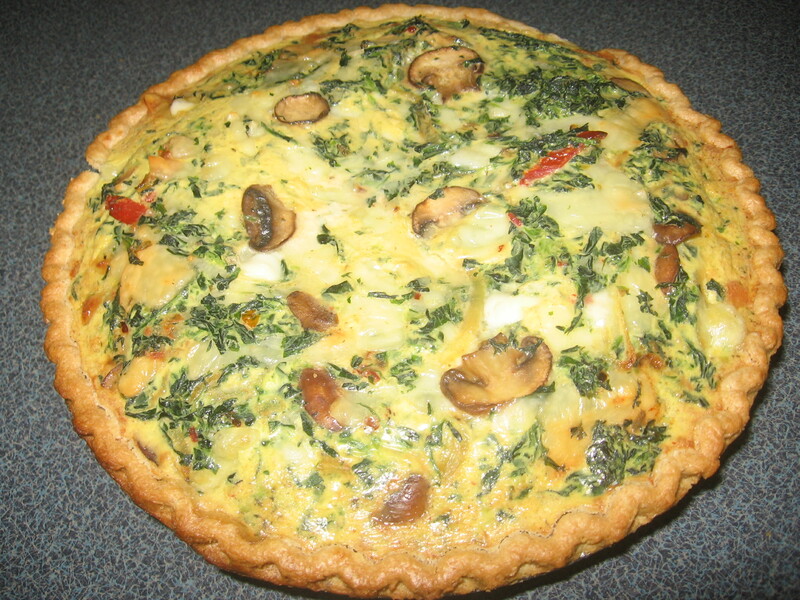 The quiche is another of my quick, easy, and delicious recipes. When I saute’d the veggies I cooked more than I needed and plan to grill a pizza for lunch using the same veggies. I love cooking things that can work in more than 1 recipe! Defrost spinach and drain out all liquid. Last night I cooked a family favorite. 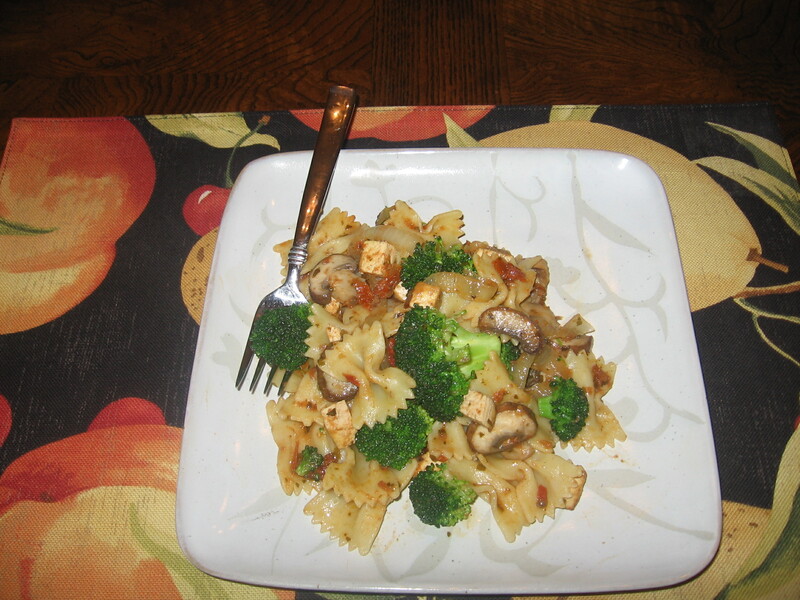 Sautéed veggies and tofu mixed with pesto and wine tossed over bowtie pasta. It’s easy to prepare and stays nicely in the fridge for several days. 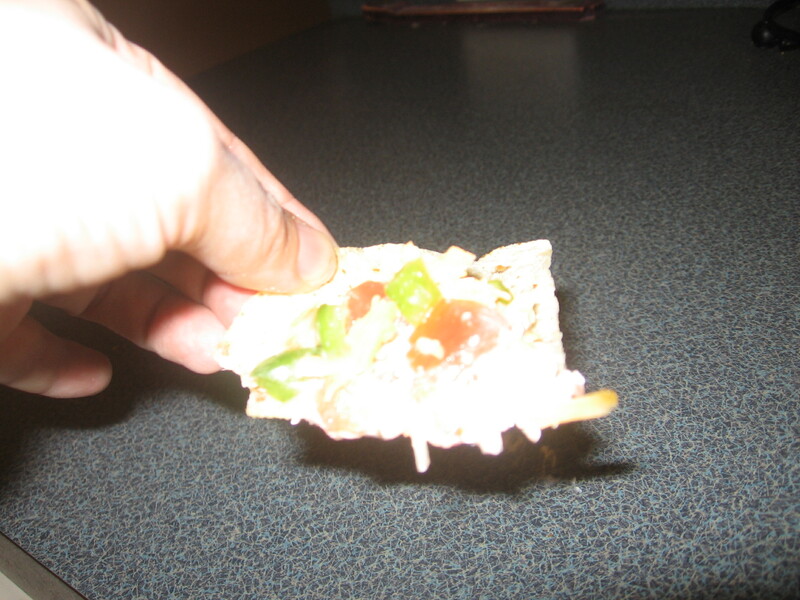 This is a great recipe to make for the busy family that often eats at different times. My son and I both pack up leftovers of this and take it to work for dinner. It reheats well in the microwave or tastes yummy cold as a salad. For my carnivorous husband I will grill a pork chop which will go very well with this. Many of my favorite meals are ones that work as a vegetarian main course and an appealing side dish for meat eaters. Cook pasta according to directions and set aside. Add olive oil to dutch oven and preheat to a medium/high temp. Add onion and sauté until they start to brown. Once lightly browned, add the tofu and some seasoning. Allow this to cook until both somewhat browned but not burnt. Add the wine and mushrooms and garlic, cook for 1 minute then add the broccoli turning the mixture until the broccoli is cooked to your likening. Add oil and seasoning as needed. In the meantime place pasta in a bowl and add about ½ the pesto. Add the cooked vegetable mixture toss added the remaining pesto until well blended. Season some more if needed and add parmesan cheese if desired.